It wasn’t long before the chicks started to launch themselves at the keeper begging for food when the nest-box door was opened. The first to leave the nest box was Chickay closely followed by Bean. Eagerly following the puppet and blindly knocking over anything in their path to get to the food: in most cases this meant pots of insects carefully weighed out for each chick. Being the smallest, Caûvette would often get pushed to the bottom of the begging pile, but once out of the nest she would stand her ground. She then developed a habit of eating a few mouthfuls then getting distracted and exploring the nooks and crannies surrounding the nest area. We took this inquisitive nature to be a good sign for her development. Watching her grow up, we might now be inclined to attribute it to her ‘ditsy’ nature instead. It will be interesting to see how this translates when she is released. The youngest of the chicks, Dingle, was the last to leave the nest box. This was several days after Caûvette had left. Although it should be noted that after every feed and brief exploratory session the chicks would jump back into the box and have a ‘nap’ until the next feed. So he was never really left alone. When he did leave he quickly turned from being apprehensive to boisterous and more agile at moving around the enclosure than the other three. Durrell’s Maintenance volunteers built a wooden ‘staircase’ complete with handrail so Harriet and Liz could safely access the nest-box when feeding chicks. The idea behind this design rather than just using a step-ladder was to avoid disturbance setting up a ladder each time, especially when the chicks were mobile. 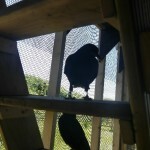 Plus, when they started learning to jump and fly around, the wide wooden steps became great additional perching points. In the last two weeks of June the chicks were so mobile that they were given access to the second shed section of the aviary. This meant the adults had fewer roosting areas to choose from. Soon the chicks had access to the entire aviary, whistle training began, and the adults had to be locked out. Whilst secure in the aviary, the youngsters have learnt some of the basic flying and landing skills. At the start this meant landing on the closest solid object they could see…the keeper’s head! Whilst endearing, this had to be discouraged as it is not a behaviour we wish them to have around members of the public. This led to a lot of ducking and diving and a new game of keeper dodge-ball was created. The chicks’ behaviour changed within a few days and feeding times became a calmer affair (although it is all relative). 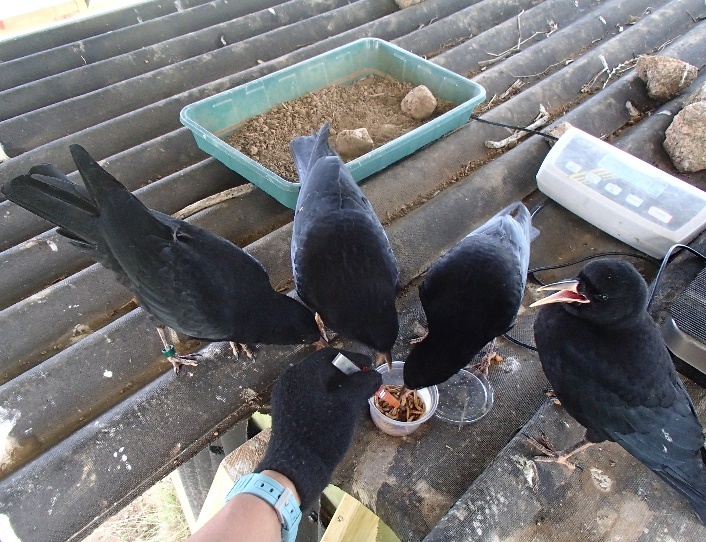 The chicks were gradually weaned off hand-feeds with insects just presented to them in dishes and the mouse diet swapped for the adult egg diet. Once this was established keepers’ started blowing the whistle as the food was presented at various target sites within the aviary. Within 24 hours the chicks had learnt to associate the whistle with food. Once they are reasonably competent they will be given the opportunity to leave the aviary if they wish. The birds need to be trained in the same way as the adults, to respond to a call for food so we have some control over them. Being hand-reared this should be easy. Within a day they learnt that the whistle meant food was around. Flying back and forth between target sites was a little trickier to pick up. Only because, whenever the adults appeared outside the aviary the chicks wanted to be with them. If the adults went to the ground feeding, the chicks would go to the ground. If the adults rested on the poly-tunnel frame the chicks would perch on the highest shelf possible. Being whistle-trained themselves, the adults reappear whenever they hear the chicks being trained so you can imagine how often the chicks’ training is interrupted. We are now working on training the chicks to a different cue whilst in the aviary and then switching back once they are released. 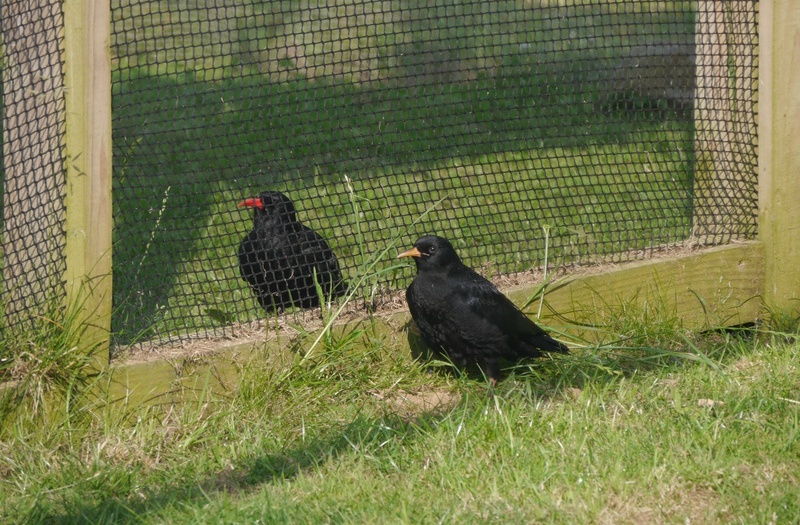 Before being released it is important to work out how the other choughs react to new arrivals. 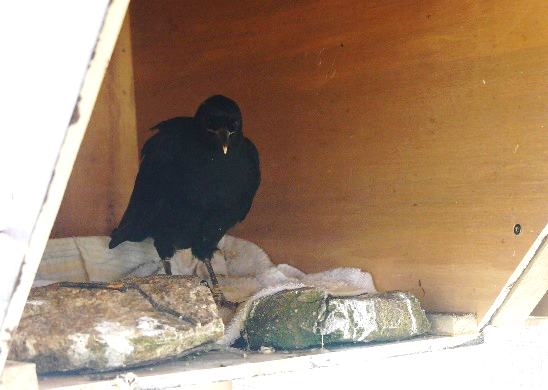 If they are accepted by the already released choughs then it will be easier for the chicks to learn from the adults. 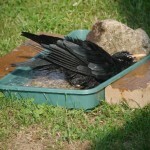 However, some of the older birds may be hostile and territorial and management issues will arise. For the first few days of the chicks being in the aviary the group was under constant surveillance. A camera was on the nest area for night time monitoring and keepers or students were taking shifts during the day keeping watch. A study was implemented to record behavioural observations looking at adult interactions with chicks. This will continue until the chicks are released providing valuable information for modelling future release management. As previously mentioned, the adults took a great interest but none of it was aggressive. If there was any it was more likely directed at the keepers in jealousy of the chicks being fed and not them. The adult females would take an interest in the chicks. On one occasion a female was seen carrying insects in her bill towards the chicks. The mesh between them prevented any feeding if that was indeed her intention. Once the chicks had access beyond the shed sections they would fly to be as close as possible to the adults when they returned to the aviary. In the absence of the adults they tended to go into the roost-box recently built by Adam and Harriet. The chicks knew without anyone showing them that they had to probe for insects. Whether this was between the timber frame looking for woodlice or in the soil, it was obviously innate behaviour. The presence of the adults at feed times has helped them develop this skill. They watched them and copied their behaviours. One behaviour they knew already was bathing. As soon as a water-tray was added Caûvette jumped (or stumbled, take your pick) into it and started flicking water in the face of the keeper. Not intentionally. It did take several attempts before she mastered the art of balancing and bathing, but don’t we all! There were a lot of firsts for the adults at Sorel as well as for the chicks. The adults adapted very well to the new residents. 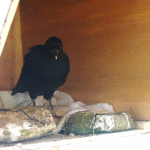 When they were locked out of the aviary for the first time they took up roosting in the quarry. This has continued and seems to be a good compromise. They spend their days away from the quarry flying between field and aviary finding food. Occasionally if it got too hot they would return to the quarry buildings presumably because the buildings were shaded and cooler. 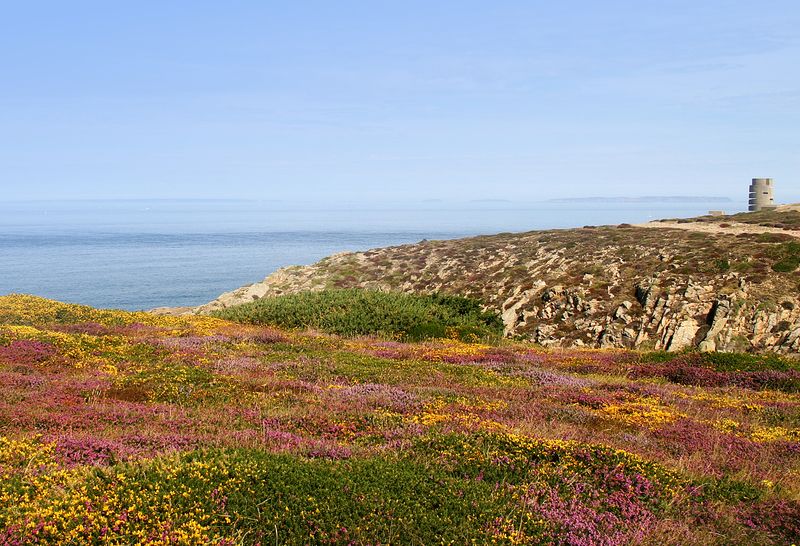 They also preferred that option during this year’s Round-the-Island-Walk when 200 plus sheep had congregated on the same patch of headland. Who can blame them? Whilst they choose to roost communally and on the whole feed together there are definite divides within the group. The young male, White, and female Black will often ditch the group to make trips back to the aviary. Red who is no longer partnered up can be seen with them or by herself entirely. It appears that the romance between Green and Mauve has faded. Now the breeding season for them is finished he, Green, has been seen with Blue who has been preening him in front of Mauve. These three are often seen perching or standing together during the day. The adults started to use the cliff face adjacent to the aviary for the first time. Again this might be because it was slightly cooler than sitting exposed on top of an aviary. Following their movements became slightly harder once all the adults had moulted their radio transmitters. 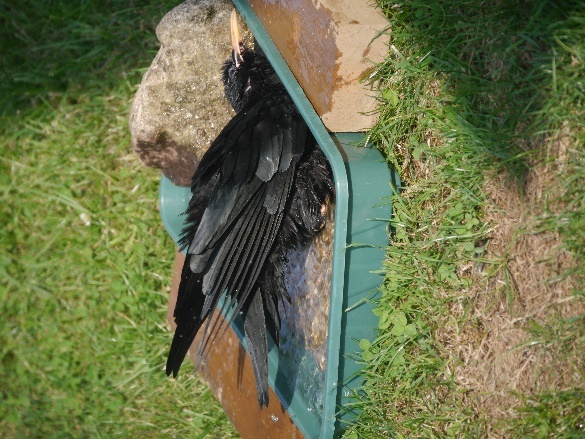 Three transmitters were recovered in the aviary; the other three could not be located. We suspect at least one was lost in the quarry. The batteries by this stage had become very weak making it difficult to pick up a signal at distance beyond 50metres. 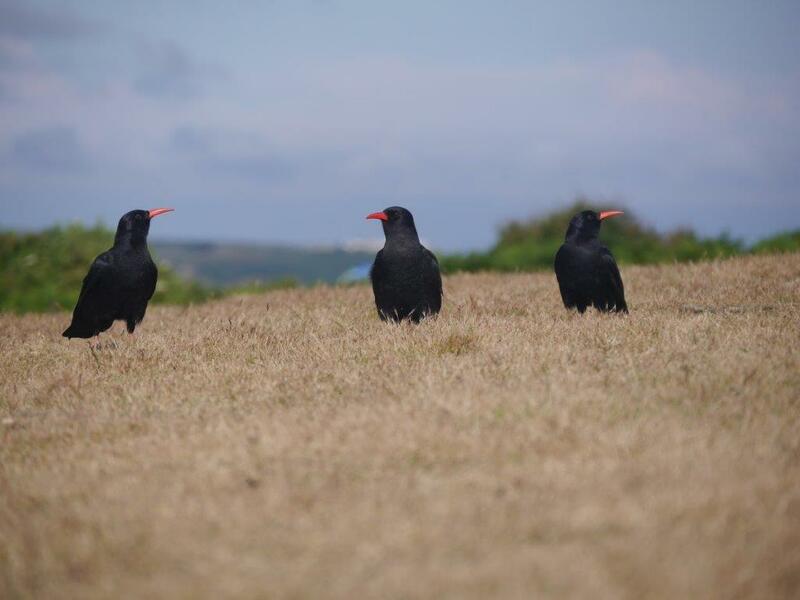 On one occasion, with no visual and only a faint signal, we had to assume the chough was fine and roosting in the quarry buildings from the echo of what sounded like a chough in a tin can! We will not replace the transmitters on all of these adult birds. 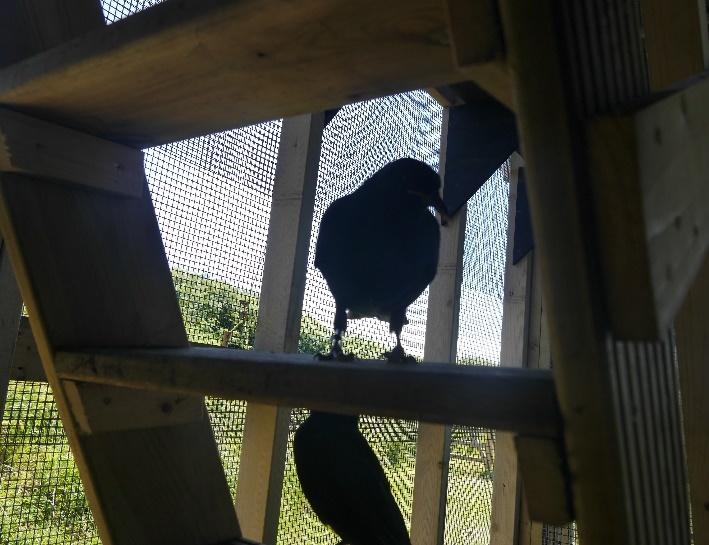 They have established themselves reasonably well in the wild and continue to use the aviary on a daily basis so we can monitor their health close up. As the 2015 breeding season approaches we may look into reattaching to the male, Green, to follow his movement as he, hopefully, attempts to set up a breeding territory. Until then the adults will be kept busy teaching the chicks all they know about life at Sorel. 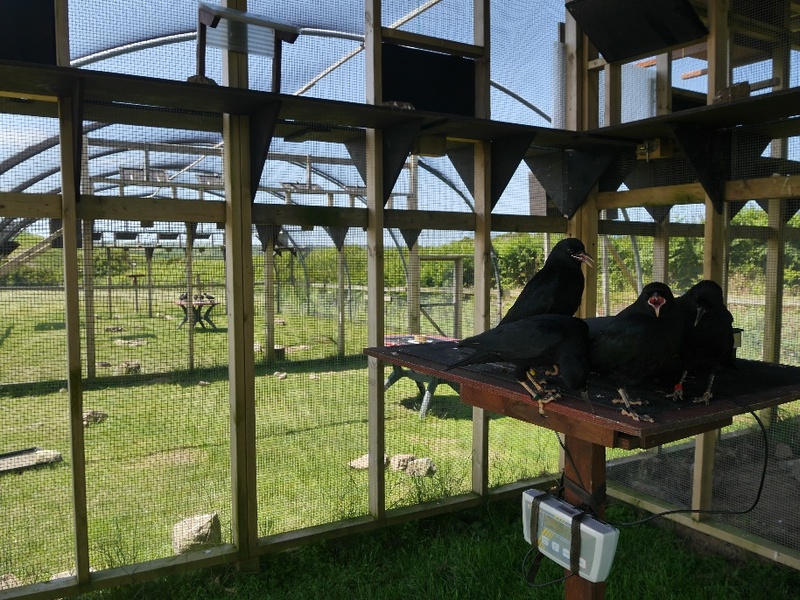 Of course we all know the best lessons are the practical ones, which for our chough chicks means venturing beyond the safety of the aviary. Faecal samples continue to be collected to monitor parasite loads in the chicks and adults pre- and post-release. We are continuing to collect faecal samples for diet analysis although we have not yet braved sifting through them trying to ID insect remains. Both these projects will continue for the lifetime of the project. Any results will be published on the Birds On The Edge website.